Raven Maps makes a spectacular wall map of the lower 48 states. 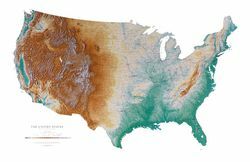 They use a cartographic technique that beautifully illustrates mountainous areas, plains, and valleys. Closer inspection reveals city names, capitals, and highway systems. The combination of elevation color tinting and shaded relief makes this beautiful U.S. wall map appear three dimensional.